Keeping good track of finances is an essential part of everyday living. It is very important for both individuals and businesses. When looking to keep good track of finances it is a very good idea to use a chart so that you can record information efficiently. One of the best ways to keep a chart is to use an Excel template. With an Excel template you will have the means to keep very organized records of all of your income and expenses. This is very helpful and beneficial for businesses. By using a chart for cash flow you will be in good position to easily make better decisions regarding finances. 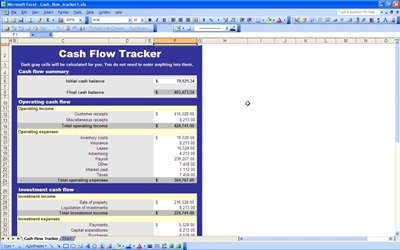 The first part of the chart for cash flow is the summary. This is a brief set of information on the cash flow chart. On this part you will get an overview of all of the cash flow from activities such as investing and operating. You will have a great way to get a very concise view of how much money the company is making. With this information a company will therefore have the means to efficiently evaluate their financial activities in a more broad aspect. When keeping a chart for cash flow you will also want to put together information of cash flow regarding the operating and investing activities of a business. The operating activities chart will help you keep track of the cash flow that is related to the everyday finances of the company such as profits and losses. Using this part of the cash flow chart will give you a good way to ensure that the company is in good standing. The investing chart will track the amount of money the company makes from financial securities such as stock as well as the sale of various types of property.